There are 3 different routes that cover the entire city, Roja (RED), Azul (BLUE) and Verde (GREN). The best routes are by far the RED and the BLUE ones, the GREEN one covers and area that it is not specially beautiful or has something interesting to see so I would skip the GREEN one. The BLUE route takes the Touristic Bus Barcelona to the Montjuïc area (Olympic Stadium, Poble Espanyol, MNAC, the Joan Miró Foundation, …) and has great views of the city and the Port so those of you that like taking pictures will love it. 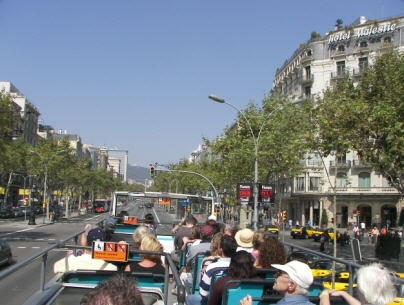 This route also covers the Port Olímpic, Ciutadella Park (Parliament and the Zoo), Plaça Catalunya and the Passeig the Gracia where it is possible to visit to of the most beautiful buildings of the city, the Pedrera and the Casa Batlló, both designed by the famous architect Antoni Gaudí. The RED route takes the Touristic Bus Barcelona to the Plaça Catalunya, the Passeig de Gràcia where it is possible to visit the Pedrera and the Casa Batlló, the Sagrada Familia (designed by Antoni Gaudí) the Park Güell (again designed by Antoni Gaudí), the Monastir de Pedralbes and the Camp Nou (FC Barcelona stadium). Tip: The GREEN route is quite poor so I would focus only on the RED and BLUE ones. At any bus, just ask the bus driver. Tickets can also be bought online. However in my opinion it is not recommended as the price is exactly the same as if you bought the ticket directly to the bus driver (no discount) and you have to pay the posting of the tickets to your home address (or wherever you want them posted to) so it is too much hassle. * Thanks to Gabriel for the picture. 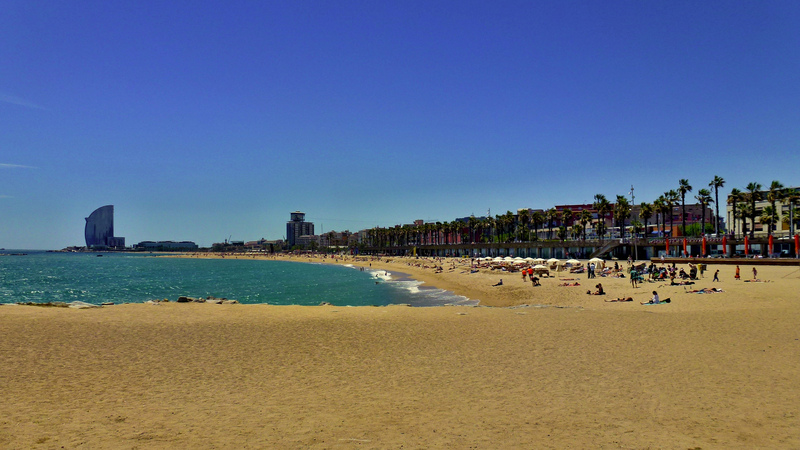 Barcelona beaches are one of the attractions of the city, especially during summer and spring time. Being in the city and being able to go to the beach walking or by public transport is something that makes this city so lovely. Barcelona enjoys a very pleasant and warm temperature when the sun shines (and this happens quite often). From Easter and until October, it is common to find people on the beach: sunbathing, playing beach volleyball, reading, having a bath or just relaxing. The best way to beat the heat is to go to one of the Barcelona beaches. After work, during the weekend or during the holidays, Barcelona beaches are always a good option to enjoy the city, disconnect even without leaving Barcelona. There are 7 beaches in total (Sant Sebastià, Barceloneta, Nova Icària, Bogatell, Mar Bella, Nova Mar Bella and Llevant), easily accessible using public transport. All Barcelona beaches are provided with disabled access, showers and lifeguards (during summer season) as well as parasol and beach chair rental services. The city council is putting a great effort into keeping them clean, both sand and water are cleaned daily. Click here for furhter details regarding up to date information of Barcelona beaches, water quality and beach condition. Finally, be aware of the risks that large exposures to the sun can cause to your skin so take the following precautions: use enough sun cream protection at all time, and try avoiding the hours from 12 to 16. Also, ensure that you drink plenty of water. There are some options for water parks Barcelona to spend a refreshing day of fun with family or friends. The water parks are not located within the city of Barcelona but a certain distance, which may be a nice option for spending one or a few days away … we have visited each one of them and are well worth… enjoy them! 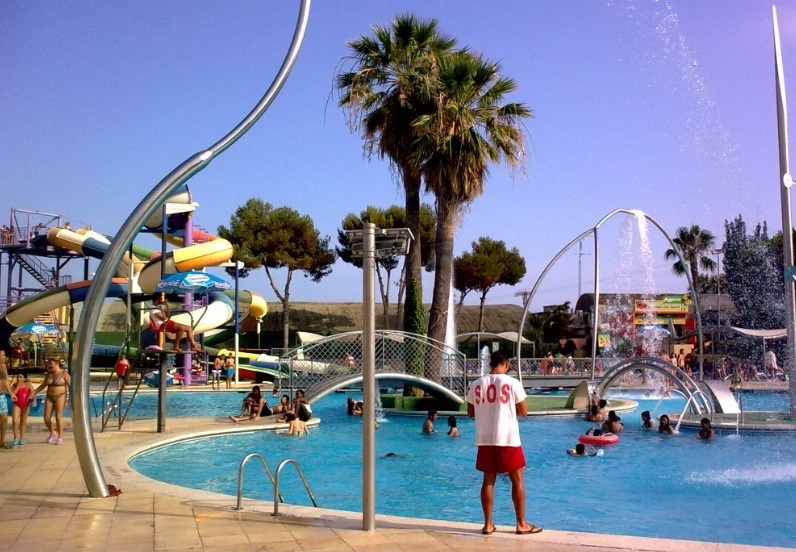 It is the closest water park to Barcelona (25km) it was founded on 1981 and it is the first Water park in Barcelona, it disposes of 22 water attractions: water slides, splash pads and swimming pools. There are lockers and different restaurants and large areas for eating out. Tickets are 26€ per adult approx and 17€ per child (child until 0,90 of height have free entrance). If you are travelling by train, the train station is Premia de Mar (Cercanias Renfe train) and besides the train station there is one bus that drives you for free to the Water park. It is located in Tarragona (1 hour from Barcelona) next to the Port Aventura Park. Also known as Costa Caribe Aquatic park, it is one of the greatest water parks in Spain. This park covers an area of ​​over 50.000 square meters and it is an excellent option for enjoying children and adults. 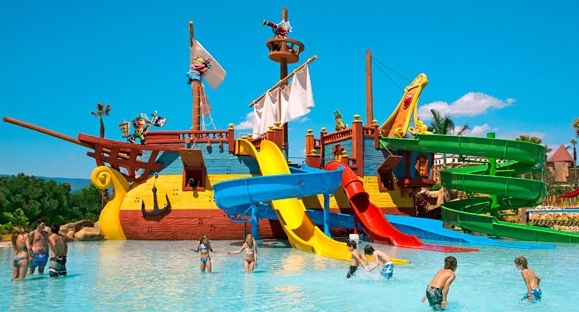 Among the water attractions are: water slides, splash pads, recreational bathing, wave pool, spraygrounds and mainly a lot and a lot of refreshing water. The park has lockers and different restaurants and large areas for eating out. Tickets are 28€ per adult approx and 24€ per child. There are tickets available for more than one day and the park disposes of several hotels right next to the aquatic park. 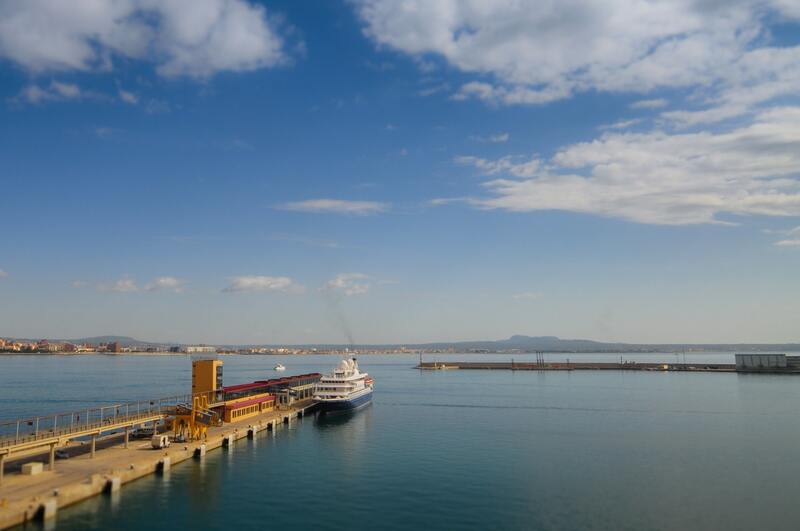 If you are travelling with Cercanias Renfe train, the train station is PortAventura, if you are travelling with or AVE train the station is Camp de Tarragona. 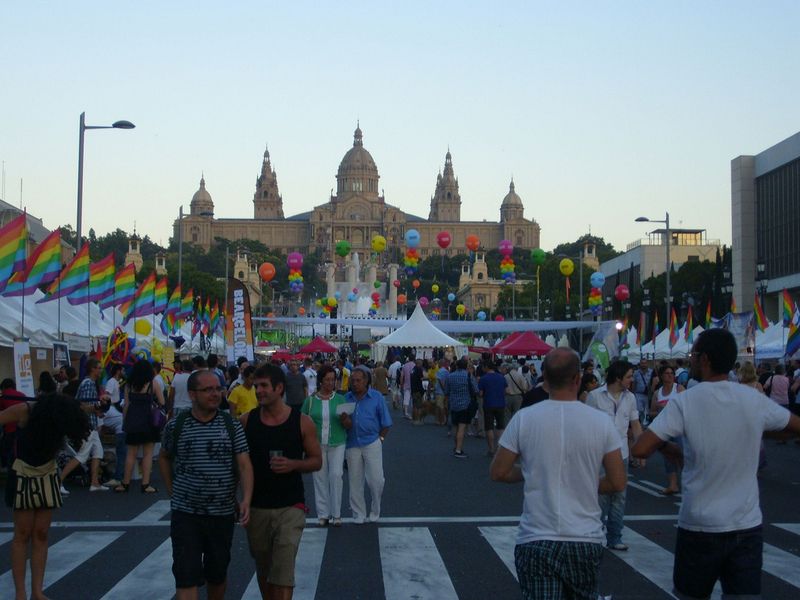 Much of Barcelona’s gay scene centres around the Eixample district and it’s here you’ll find all the major LGBT festivities like Gay Pride, the Circuit Festival Party weekend in August and the International Gay & Lesbian Film Festival in October. The Eixample is usually a very busy place, especially on weekends. Take note: Generally speaking the Spanish are famed for being late-night party revellers and much of the scene doesn’t get going until after midnight, so don’t be surprised if you turn up early and it doesn’t seem that busy – the party people, they will come! Considered somewhat of a mecca in Barcelona’s gay scene is the Axel Hotel Barcelona Rooftop Terrace “Sky Bar” which overlooks the city and is considered a very hip place to sip and savour a cocktail. 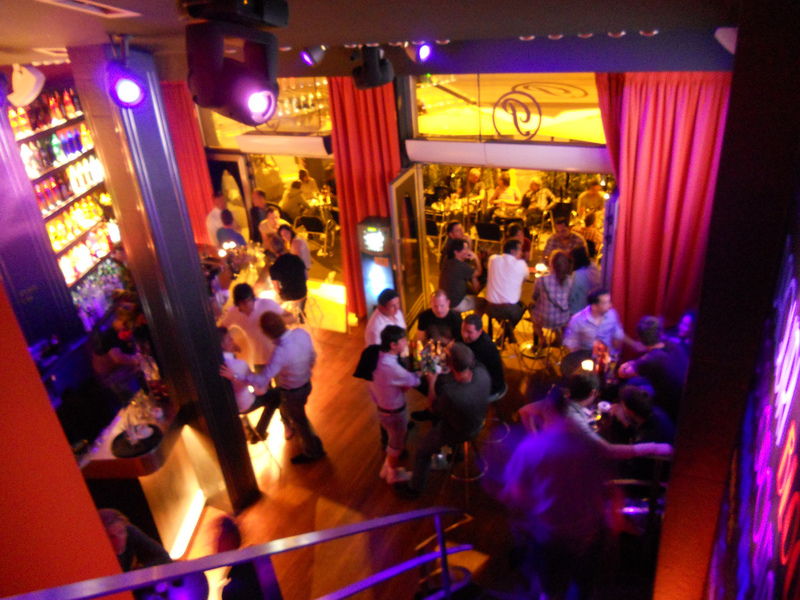 Head to the likes of Osbar, BoysBar Bcn or El Cangrejo Eixample for a cabaret drag show. Then there’s La Chapelle with its religious-themed interior design, friendly local bar Casa de la Pradera, cocktail bar Moeem, the very kitsch La Penultima, and Bar Átame. 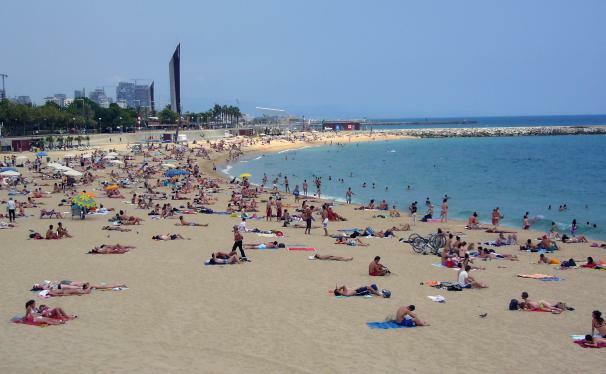 Part of what makes Barcelona so special is that a stone’s throw from the hustle and bustle of the city centre, there’s a long stretch of golden sand at Barceloneta beach. Go for a swim, enjoy water sports like windsurfing or just relax and soak up the sunshine. Everyone is welcome here. All the way along the promenade are several other beaches, all of which are gay friendly and some are popular hang-outs for LGBT locals and tourists. Check out Nova Icaria, Bogatell and Mar Bella (this beach has a nudist area). 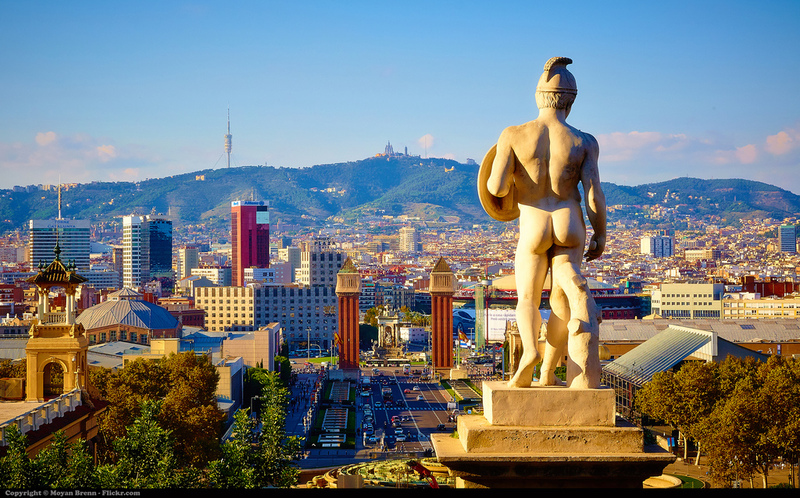 After wandering along Las Ramblas and touring Barcelona’s famous Gaudi inspired landmarks like the La Sagrada Familia, get away from it all and head to the beach. There’s no such thing as a ‘gay’ hotel or ‘straight’ hotel anymore as the days of discrimination have thankfully faded as the world goes through a major attitude change towards LGBT people. About time too! So check out a selection of hotels that are just ‘friendly’ (not gay friendly or hetero friendly).